In an age of texting, emailing, instant messaging and Tweeting, letter writing may seem to many, including your kids, to be “old fashioned”, or even “not very useful”. Don’t get me wrong, I completely understand the appeal and benefit of a quick and pithy email or text. However, letter writing shouldn’t get lost and forgotten in this cyber fray. Not only can it help our kids with not-so-glamorous items like grammar and punctuation, but this pen-to-the-paper activity is a creative, fun avenue for kids to share their feelings and connect with loved ones. In the writing skills area, letters present great opportunities for kids to compile complete and thoughtful sentences. Does this sentence say what I meant it to say? Are the periods where they should be? How about uppercase and quotation marks? Letters also encourage kids to write legibly and carefully. Before writing thank-you notes, letters to Grandma and Grandpa, or letters to Santa/The Easter Bunny/Tooth Fairy, advise your kids to take the time to think about what they want to say and how they want to say it. The recipient will not only feel special knowing that the writer took the time and effort to write the letter, but will also appreciate the message and thoughts in the letter itself. Your child can also personalize the letter with drawings, stickers, and enclosures such as photos and recipes. In turn, it’s fun and exciting for your child to receive a letter back. Let grandparents know that your child would love to receive a letter from them, and be sure Santa et al. are on board with writing back (and answering each and every question) as well. A great letter-writing practice is connecting with a pen pal, which allows kids to learn about other cultures, places, situations, and gain a new friend in the meantime. When I was in fifth grade, our teacher started a pen pal program. My pen pal, Debra, was the same age as I and living in Sydney, Australia. I looked forward to every letter from her. It was fun hearing how similar but different our lives were. I got a kick out of seeing her unusual cursive handwriting and how she called her mom “mum”. But just be sure you connect with your child’s pen pal through a reliable source. 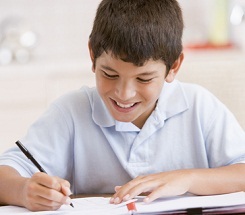 The article “Find a Pen Pal: Making Friends Far Away Makes Them Closer to You” at http://deniseoliveri.suite101.com/find-a-pen-pal-a29968 has some tips for getting your child started. Letter-writing can also help kids delve a bit deeper into their feelings of curiosity, joy, and even sadness. Writing a letter is usually done when you have the time to sit and really think. Although they lack the immediacy of an email or the brevity of a text, your child can spend time describing, thinking, and articulating. This can often lead to more expression and emotions in a letter. As a result, it may surprise themselves and parents at what and how much they think about certain events, people, situations going on in their lives – from soccer and Selena Gomez to test-taking and the mean lunch lady. I’ve also discovered that letter writing is also an excellent way for my daughters to connect with older generations in our family. My husband’s parents are wonderful about emailing, but I know they love a good letter from our girls. I notice that my mother-in-law proudly posts the thank you notes she receives from her granddaughters on her desk bulletin board. I still have the many letters that my late mother sent to me while I was in college. I love looking at her flowery, fluid handwriting written on translucent pink onionskin paper. I loved and appreciated the thoughts she wrote to me while I was away. These are very important keepsakes to me today, not only because she is now gone, but also because I can pick them up, hold them, and read them with all their special thoughts and meaning. Although a fun kids’ activity, letter writing goes beyond the youth years. It’s a useful skill for when your kids are older and looking for a job, writing a letter of complaint, or maybe supporting a cause they believe in. Or perhaps even for when they want to keep in touch with you and thank you for the many precious years of parenting.